Peasant farmers participating in demonstrations in Catatumbo, north-eastern Colombia, are at risk after at least four protesters were killed and others injured. There are fears that security forces have been using disproportionate and excessive force, particularly following government claims that guerrilla forces have infiltrated the demonstrations. 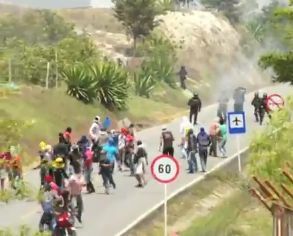 Dozens of peasant farmers have been injured during protests in the Catatumbo area, Norte de Santander Department that began on 11 June. Two protesters were fatally injured on 22 June, and a further two on 25 June. There is concern that the anti-riot police (ESMAD) and the armed forces have used excessive force in dealing with demonstrators. Some protesters have been arrested. There have also been reports that members of the security forces have been injured. The security forces have a duty to guarantee the safety of their colleagues, but this should not be used as an excuse to ignore international standards on the use of force by security forces. Since 11 June thousands of peasant farmers, led among others by the Peasant Farmer Association of Catatumbo (Asociación Campesina del Catatumbo, ASCAMCAT) have been protesting. They are demanding the implementation of a Peasant Farmer Reservation Zone (Zona de Reserva Campesina), which has been agreed with the Colombian Institute for Rural Development (Instituto Colombiano de Desarrollo Rural, INCODER), and for a programme that substitutes illicit crops. Government authorities have sought to undermine the protests by claiming that guerrilla forces have infiltrated the demonstrations. On 21 June, at a ceremony for police officials, the Colombian President Juan Manuel Santos claimed that the protest had been infiltrated by the Revolutionary Armed Forces of Colombia (Fuerzas Armadas Revolucionarias de Colombia, FARC). On 24 June this claim was repeated by the national police director in charge of public safety. There is concern that such accusations may encourage members of the security forces to employ excessive force against demonstrators, as these claims were followed by fatal injuries. Asking the authorities to publish the results and bring those responsible to justice, and ensure that the security forces refrain from excessive and disproportionate force in line with international standards. All the warring parties in Colombia’s long-running armed conflict have repeatedly failed to respect the civilian population’s right not to be dragged into the conflict and have been responsible for serious human rights abuses and violations of international humanitarian law. Amnesty International has repeatedly called on both sides in the conflict – guerrilla groups and the security forces – to put an immediate and unconditional end to human rights abuses and violations of international humanitarian law. In the past, accusations by state and government officials and the security forces which have sought to link the peasant farmer movement to guerrilla groups have often been followed by the killing of leaders from these communities by paramilitary groups. Many leaders have also been killed by the FARC, which have accused some communities and their leaders of collaborating with the security forces and paramilitaries. On 13 March an explosive device was thrown at the gate to the offices of ASCAMCAT and the Luís Carlos Pérez Lawyers‘ Collective (Corporación Colectivo de Abogados Luís Carlos Pérez, CCALCP). The device exploded but no one was injured. Members of ASCAMCAT have repeatedly reported that they have been followed by unknown individuals, for example on 22 June. The Peasant Farmer Reservation Zones are established by the Colombian Institute for Rural Development for the stabilization and consolidation of the peasant farmer economy. They are a way of providing access to land tenure and social services. They are also meant to ensure food security. The Catatumbo area, which borders Venezuela, is an area of economic and military strategic importance. In an attempt to establish control of the Catatumbo, army-backed paramilitaries launched a series of incursions in the area in 1999 and subsequently consolidated their presence in the region with serious human rights violations against the civilian population. Guerrilla forces for their part responded to the paramilitary presence in the region with numerous killings of civilians they accused of collaborating with their enemies, including massacres of peasant farmers working on coca plantations in areas of paramilitary control. Please Send appeals before august 7 using the word document with adresses below.